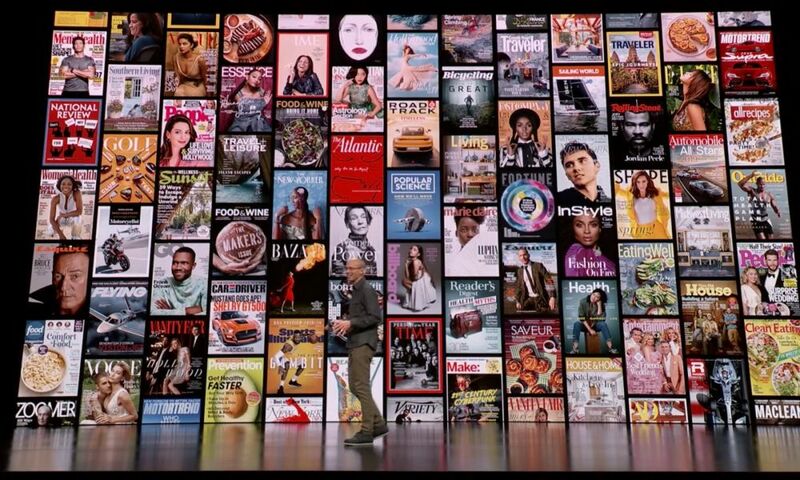 Apple News is getting a big upgrade with the introduction of a premium subscription that will allow access to magazines, newspapers and digital news outlets. The service, dubbed Apple News+, will allow users unlimited access to more than 300 magazines for a single monthly fee. There’s a slew of publications across various topics, including entertainment, fashion, news and politics, lifestyle, food, travel, technology, and more. In addition to those magazines, Apple News+ also includes premium digital subscriptions, such as paywalled content on The Skimm and TechCrunch, as well as several legacy newspapers like The Los Angeles Times, The Wall Street Journal, and Canada’s The Star. Apple News+ is accessed using the standard free version of the Apple News app included on iOS and macOS devices. With an Apple News+ subscription, users will see their favorite magazine titles, as well as the full catalog of available publications in a new News+ tab. Like original Apple News content, Apple News+ features hand-curation by Apple News editors. But these suggestions aren’t just limited to the channels users already follow, subscribers can get content recommendations on topics they may be interested in from publications that they might not read regularly. All of the news content, like photo essays and articles, is designed specifically for Apple’s various hardware devices. That includes clever exclusive features and design elements like moving “Live covers,” mobile-optimized editorial content design, and an intuitive user interface. For reading on-the-go, the Apple News app will download the latest edition of a user’s favorited publications so they can read without a Wi-Fi or internet connection. Like all of Apple’s services, Apple News+ is built on a foundation of privacy and security. Apple News doesn’t know what their subscribers read and it doesn’t let advertisers track them. All personalization is done on-device. Apple News+ is priced at $9.99 a month, which includes all of the aforementioned content (which Apple notes would cost about $8,000 a month normally). Better yet, Apple will also let users share that subscription with family members using Family Sharing at no additional cost. At launch, Apple News and Apple News+ will be available in the United States, as well as Canada in both English and French. Apple also said Apple News+ (and presumably regular Apple News) is coming to Australia and the U.K. later this year. Apple News+ will be available to users starting today. All users need to do is install the latest macOS and iOS updates to access it. Even if you don’t want to pay for Apple News+, the first month of the service is free for Apple device users.